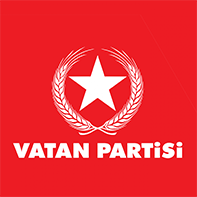 The Patriotic Party (VP) was established on February 15, 2015 at a Workers' Party's (İşçi Partisi) Extraordinary Meeting, titled 'Unity for National Government'. It was changed to the Vatan Party as per the meeting agenda, to bring together and unite populists, nationalists, and socialists under a left-oriented neo-nationalist political line. Its founder Doğu Perinçek has been active in Turkish politics since the 1960's, shifting from National Democratic Revolution thesis to Maoism, than to neo-nationalism. Its emblem is a star embraced by the wheat grain. Wheat grain symbolizes homeland and labor and the star symbolizes guiding spirit of science and the vanguard party.